In effort to promote a healthy lifestyle, all food and beverages sold to students during the school day* that are not part of the school meals are subject to the Smart Snacks regulatory requirments. The standards apply to all locations that are accessible to students. Examples include food and beverages sold a la cart in the cafeteria, in school stores, at snack bars, and in vending machines. Additionally, food and beverages sold during fundraisers must meet the Smart Snack Guidelines, unless those items are not intended for consumption during the school day. Items include frozen pizza, cookie dough, and other items preordered and distributed in a precooked state for consumption not on school campus. Please note that Smart Snack standards only apply during the school day; items sold during non-school hours, on weekends, and at off-campus fundraising events are not subject to these guidelines. *The school day is defined as the midnight before to 30 minutes after the end of the school day. • The food must then meet the nutrient stands for calories, sodium, sugar, and fats. 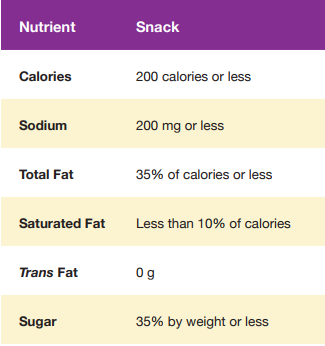 The Smart Snacks Calculator, which can be found on the Alliance for a Healthier Generation’s website is an excellent tool for determining whether a snack or beverage meets the Smart Snacks Guidelines. 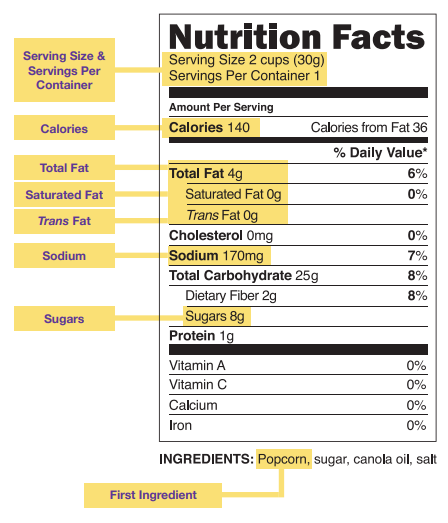 Simply input the product information of serving size, calories, total fat, saturated fat, trans fat, sodium, and sugars that appears on the Nutrition Facts Label to determine Smart Snacks Compliance.